considered one of the most beautiful of Sardinia. Sandy golden dunes, a sea with thousand shades of blue, the small lagoon populated by pink flamingos, the colours will remain in your memory after a holiday in this part of Sardinia. The Hotel Aquadulci is located in Chia and is about 400 m away from the beach. Chia means freedom, discovering an enchanted nature. Everything is surprising, all senses are involved: an unspoiled enviroment, breath-taking landscapes, spectacular views (lagoon, sand dunes and open sea), white soft sand between your toes and the sweet scent of Mediterranean vegetation. Between the beach and the mountains, from the Hotel Aquadulci you can reach the wonderful beaches of Cala Cipolla, Cala Zafferano and Tuerredda, Torre Chia, Capo Teulada and Capo Malfatano with the car or by boat. The Hotel Aquadulci is the natural choice for those who want to blend the finer aspects of vacationing with the sweet senses of living. The 2-storey hotel - nestled beside one of the most beautiful beaches in the Mediterranean - blends harmoniously with the lines and colours of the surrounding landscape, with elegant and pure architecture rich in natural materials (stone, wood, terracotta), panoramic windows, delicate and relaxing colours, a garden with age-old palms through which a path leads to the beach. A place where water meets earth, where the blue dives into the green (the blue of the sea, of the lagoon, of the wide, smooth swimming-pool and the green of the hills and the garden). 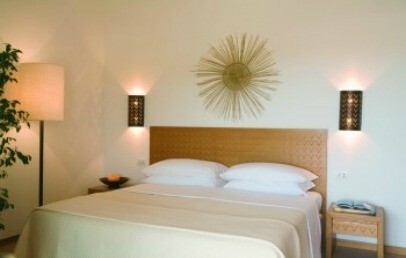 The decoration of the rooms shows a modern simplicity combined with a warm and personal touch. Each of the 41 rooms is different, finely furnished with air conditioning, internet connection Wi-Fi, satellite TV, mini bar, safety box, hair dryer, bathroom with shower. Classic located at the ground or first floor, road side. Garden located on the ground floor or first floor with patio, garden view. Sea Side located on the first floor with balcony, sea side. Superior more spacious as the Classic, on the ground or first floor country side view. Superior Garden are more spacious as the Garden rooms with direct access to the hotel garden. Superior Sea Side are larger than the Sea Side rooms and offers a sea side balcony. Suite have one bedroom with shower, living room with balcony or patio with country side/garden view. Can host up to 4 persons. Suite Sea View located on the first floor and have one bedroom with shower, living room with balconyo on the sea side. It can host up to 4 people. Room for handicap people available. The nearest beach is only 400 meters away, and it’s reachable from the hotel through an unmade path. The beach service is to pay on spot. In addition to this, the area of Chia is rich in other beautiful beaches and bays, to be reached by car or bicycle. The fine and clear sand characterizes this area; the imposing junipers along the beaches frame the turquoise blue sea. Nearby the Hotel Aquadulci you can play golf at Chia Golf Club (9 hole Pitch & Putt) at 700 m distance or at Golf Club Is Molas (27 holes) at 16 km distance. Good possibilities are offered for bike tours or any kind of water sport activities as kitesurfing, windsurfing or sailing. Let Aquadulci surprise you with good cuisine, respectfully prepared with regional and national traditions at "Aquadulci" restaurant. Aquadulci is the perfect place to pamper your senses and to give into your desires. It is a place in which to refresh body and soul. You can let the sun caress you for a whole day at the close beach (beach service: umbrellas and sun beds at extra costs), or go for a tour of the coast, discover hidden coves or explore (by bike, horse or four-wheel car) the trails among sand dunes and fields extremely rich in Mediterranean flora. You can kite-surf, snorkle in a sea rich with fish or improve your score on the golf courses of Chia and Is Molas. You can refresh in the pool and enjoy the scenery. The guests, during their stay, will have the possibility to enjoy the following services: lounge bar, swimming-pool, parking, boat and bicycle rental, horseback riding, kite-surfing, windsurf & wave-surf classes, massages, yoga lessons. Small pets are allowed, on request, with a surcharge for the daily cleaning of the room (€ 10,00 per day). Tourist tax – of € 2,00 per person/overnight, to be paid cash on spot at the check-out. Children under 11 years are exempted. The tax is applied during the entire season. The Classic rooms are located on the ground floor or on the first floor, in the external side of the hotel. They are decorated with soft colours, in shades of beige. They have private bathroom with shower and view on the street. Some, more spacious, are equipped for disabled guests. All rooms have Wi-Fi connection and beach towels. 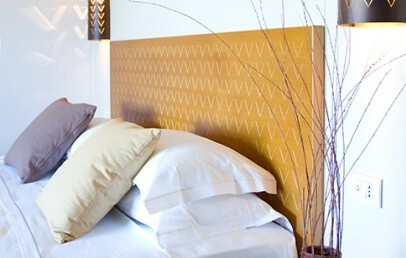 Superior rooms are decorated with soft colours, in shades of beige. They have private bathroom with shower and are located on the ground or first floor in the external side of the hotel (field /country side). All rooms have Wi-Fi connection and beach towels. The Garden view rooms are located on the ground floor or on the first floor. They are decorated with soft colours, in shades of beige. 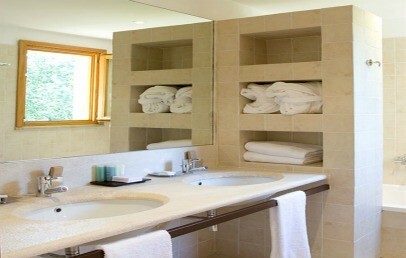 They have private bathroom with shower and a covered patio with direct access to the hotel garden. All rooms have Wi-Fi connection and beach towels. Superior Garden are decorated with soft colours, in shades of beige. They have private bathroom with shower and a covered patio with small garden with direct access to the swimming pool’s garden. All rooms have Wi-Fi connection and beach towels. 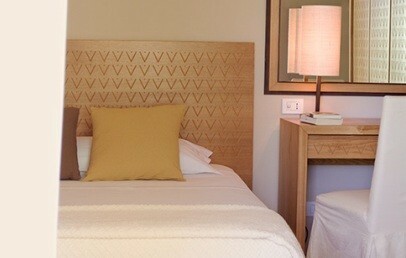 The Sea Side rooms are located on the first floor and are decorated with soft colours, in shades of beige. They have a bathroom with shower and a balcony with sea side view. All rooms have Wi-Fi connection and beach towels. Superior Sea Side View rooms are decorated with soft colours, in shades of beige. They have a bathroom with shower and a sea side balcony. All rooms have Wi-Fi connection and beach towels. Suite are decorated with soft colours, in shades of beige. They have a comfortable living room, separated from the bedroom by a door. They have a private bathroom with shower and two sinks. The Suite can have a balcony or a patio, the view is on the field/countryside or on the garden. All rooms have Wi-Fi connection and beach towels. They can accommodate up to 4 people. Suite located on the first floor and decorated with soft colours, in shades of beige. They have a comfortable living room, separated from the bedroom by a door. They have a private bathroom with shower and two sinks. The Suite have a balcony with view on the sea. All rooms have Wi-Fi connection and beach towels. They can accommodate up to 4 people.